This work is a continuation of my PhD research and combines observations from the Tiree Passage Mooring and a FASTNEt drifter release study. This constitutes a case-study for my wider interest in ocean-shelf interaction between the Atlantic and the Arctic. 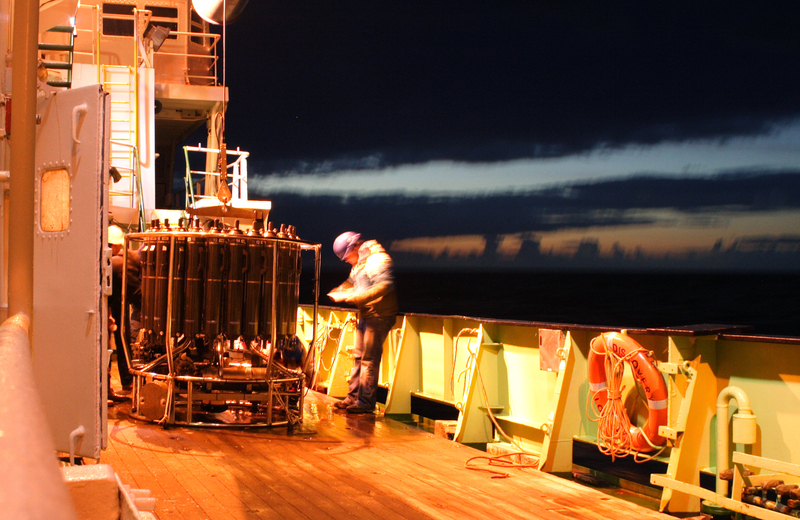 A drogued GPS drifter being deployed from the RRS James Cook. The drogue is packaged in water-soluble cardboard, and forms an 8 metre-long ‘sock’ when deployed. The drifters were released at the continental shelf edge west of Scotland in summer 2013 from the FASTNEt JC88 cruise. Contrary to expectations, all drifters drogued at 15 m moved onshelf in a coherent group and were entrained in a cross-shelf jet-like current north of Ireland (Porter et al., submitted). a) Pathways and velocities of deep drifters crossing onto the continental shelf in summer/autumn 2013, vs. b) during a series of intense storms in December 2013. The movements of drifters drogued at 70 m were more nuanced, with several breaking away from the shelf edge and recirculating in Rockall Trough eddies. A pair of drifters arrived back at the shelf edge in December 2013, which coincided with an extremely stormy period. I’ve previously noted that these periods generate strong but short-lived pulses of high salinity near the coast (Jones 2018) suggesting that oceanic water is displacing coastal flows and forcing its way into the inner continental shelf. The recirculated drifters captured this intense on-shelf flow and allowed us to quantify the associated volume transports. Meanwhile the Tiree Mooring recorded how these storms altered coastal water properties. Porter, M., Dale, A., Jones, S.C., Siemering, B., Inall, M.E. Cross-slope flow driven by the on shelf deflection of a slope current: a supply of nutrients and heat to the European Shelf. Submitted to Deep-Sea Research Part I, May 2018.